DC’s Legends Of Tomorrow just had two episodes that took a big bite out of the budget with lots of period costumes and sets, so “Land Of The Lost” is a smaller scale episode in terms of production values. The action either takes place on the Waverider or in a generic forest setting that is supposed to be 69,997,983 B.C., but budget restrictions don’t stop the writers from delivering some big events as Rip Hunter finally returns to the side of the heroes after spending some time as a brainwashed villain. But first, he screws things up for his old team by overriding Gideon and sending the Waverider hurtling through the timestream. He destroys the medallion that would help the Legends track down the piece of the Spear Of Destiny held by Nate’s grandfather, and generally makes things a lot more difficult than they have to be. The team is stranded in the Cretaceous period, but that doesn’t mean it’s suddenly surrounded by dinosaurs. Ray mentions to Nate and Amaya that they’re in the territory of Gertrude the T-Rex, who has a vendetta against him for stealing one of her eggs when he was in this time period back in the season premiere, but Gertrude is heard rather than seen for the majority of the episode. Instead, the action off the Waverider focuses on Nate and Amaya’s developing romance and the complications surrounding their courtship. Stargirl’s talk with Amaya in the last episode has her reconsidering her “no fraternization with teammates” stance, and she’s decided to be true to herself and let go of the rules if it means being happy with someone she cares about. Nate is very receptive to this new Amaya, but Ray warns him not to get involved. Unlike the rest of the Legends, Amaya wasn’t recruited to the team because her absence wouldn’t have a profound effect on the timeline. She showed up after Rip was gone, and she has her own destiny that can’t be interrupted by a new future with Nate. Amaya eventually needs to go back to her home village of Zambesi and have a daughter, who will have a granddaughter, Mari, that becomes the modern-day Vixen in Detroit. If Amaya doesn’t follow this path, the future of Mari and all the people she’s saved is put in jeopardy, and Ray gives Nate this information so that he treads carefully with Amaya. Nate realizes the scope of his feelings when Amaya confronts a rampaging Gertrude, and while nothing bad happens because Amaya channels the essence of a T-Rex to calmly communicate with the dinosaur, Nate is shaken by the prospect of her death in that moment. He knows that it’s impossible to keep this relationship casual, putting him in a complicated position where he needs to step away to safeguard the future of Amaya’s bloodline despite the intensity of his feelings for her. That’s hard because Amaya is coming on very strong, but in this situation, being a hero means turning down that trip to Amaya’s quarters. Rip has become a real nuisance for the Legends, and the team turns to the Time Lords’ barbaric and dangerous “cognitive invasion” process to get back the Rip they used to know. Sara and Jax decide to take on the responsibility of sending their consciousnesses into Rip’s mind in hopes of freeing him from the Legion Of Doom’s brainwashing, and they land in a darker version of the Waverider because it’s an environment that Rip is most familiar with and also one that the show doesn’t have to pay extra money for. Sickly green lighting indicates that this is a sinister landscape, and Sara and Jax have to face off against evil versions of themselves and their teammates on their way to recovering Rip. It’s fun to watch Sara Lance beat people up (including herself), and this episode could have gone even further with the hand-to-hand combat and padded out the story with more intricate close-quarters fighting, something that Caity Lotz has proved her skill with over and over again. The strangest aspect of this episode is the personification of Gideon in Rip’s mind, and Amy Pemberton gets the opportunity to lend her face and body to the A.I. she’s been voicing since the start of the series. 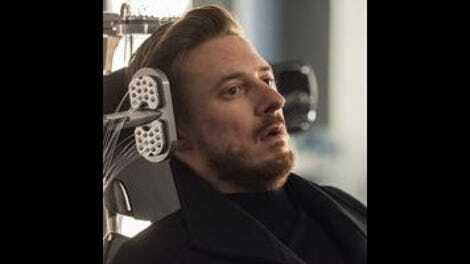 While the rest of Rip’s teammates have been corrupted by Eobard Thawne’s programming, Gideon remains benevolent because Thawne didn’t consider the A.I. a potential threat, and she helps Jax track down Sara and Rip, who are trapped in the bring. Sara is impressed by how hot Gideon is, but it really gets weird after Rip asserts his dominance over his mind and takes out the warped versions of his teammates. Before Rip leaves his mindscape, he shares a tender moment with Gideon in which she tells him that she’ll always be there for him, and her dedication inspires him to grab her for a passionate kiss. This episode brings a new twist to shipping in having Rip Hunter make out with the A.I. that runs his ship, but it’s a surprisingly effective moment that works because the series has already established a strong rapport between Rip and Gideon. Amy Pemberton has done strong work giving Gideon a personality with only her voice, and she feels like a valuable member of the team, which makes it all the more delightful when she shows up as a human being in Rip’s mind. 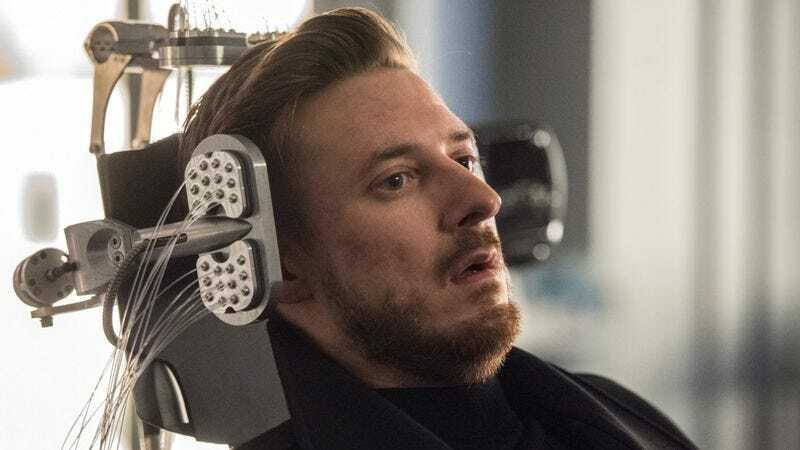 Arthur Darville was absent for most of this season, but he’s had a lot to do since coming back, and the severe changes with his character have shown his versatility as an actor. He got to play a confused stoner, then an unapologetic menace, and in this episode he’s frightened, vulnerable, and unsure of his own strength. He regains his power and his confidence with the help of his teammates, and by the end of the episode he’s back in a leadership role, although it’s implied that he’ll be sharing captain duties with Sara moving forward. The whole team is back together, and now it’s time for them to retrieve the Spear Of Destiny and take out the Legion Of Doom before all of reality falls prey to a trio of supervillains. I hope Amaya is able to tap back into the T-Rex essence again because that would be awesome in action. I would like to know where Ray got all that male T-Rex urine. That sounds like an interesting story. Martin has so little to do in this episode I almost forgot he was in it at all. Ray’s little rock versions of his teammates are adorable. Ray is pretty adorable in general.